The Conference of Peripheral Maritime Regions (CPMR) and its Islands Commission (IC) have signed an important Memorandum of Understanding with the Observatory on Tourism for Islands Economy (OTIE) to enhance the analysis and promotion of sustainable tourism on European islands. 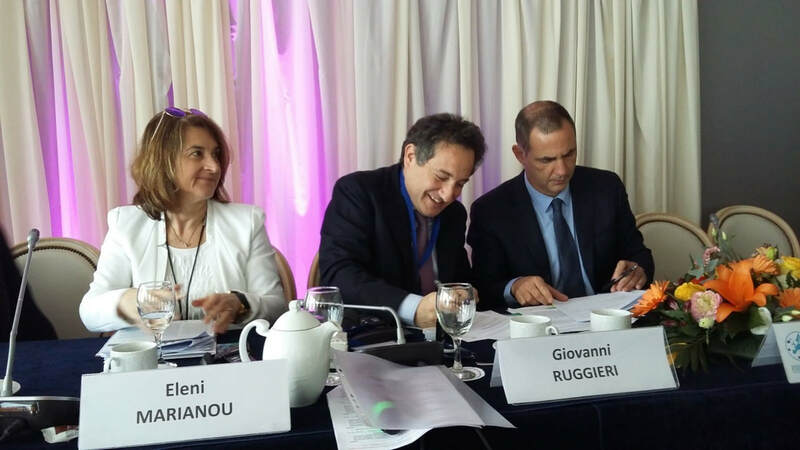 This Memorandum was signed during the Islands Commission’s General Assembly in Corfu, 21-22 March, between the CPMR Secretary General Eleni Marianou, the IC President Gilles Simeoni and OTIE President Giovanni Ruggieri. This unique cooperation will focus on issues related to islands and development of sustainable tourism and will entail research and analytic studies, exchanges of data and relevant information, project-based cooperation, joint dissemination and lobbying efforts. The CPMR, its Islands Commission and OTIE are therefore committed to bring together key actors from the sector of sustainable tourism in islands and will jointly organise workshops, working groups of experts and collaborations with the business community. As European islands face significant challenges related to tourism, such as over-tourism, high seasonality and resources management, this new partnership is expected to better support tourism management and policy-making in islands from the Mediterranean, across Europe and beyond. La Fondazione Romualdo Del Bianco® , nell'ambito di Life Beyond Tourism® promuove il Premio Heritage for Planet Earth®, un concorso fotografico a premi che invita a sviluppare il concetto di “viaggio culturale” come opportunità di incontro, comunicazione e dialogo tra culture, per la conoscenza e il rispetto della diversità culturale e per il rispetto della salute del pianeta Terra. Il concorso si aprirà ufficialmente a gennaio 2018 e avrà la durata di un anno (dall'1 gennaio al 31 dicembre 2018). Lo scopo del concorso è quello di sensibilizzare, soprattutto le giovani generazioni, al tema della fragilità del patrimonio -culturale e naturale- coniugata agli equilibri sul pianeta Terra e i conseguenti cambiamenti climatici. OTIE, as scientific partner of ALTER ECO project, has been working for the definition of methodologies related to the management of the flows of tourism, the promotion of forms of sustainable tourism and management of tourism pressure in the Mediterranean area. Authorities, organizations and individual bodies interested in these themes are invited to contact us for further information. The President of The Observatory on Tourism in the European Islands –OTIE –has the pleasure to inform that OTIE has been joining since 2016 The European Tourism Manifesto for Growth& Jobs as organization of the European tourism industry, unique expert in development of the tourism in European Islands. The Manifesto is a document which highlights the EU Policy priorities for the tourism sector in the coming years. Within the framework of its mission and through its sectorial knowledge and its relevant network, OTIE will give its significant contribution for the improvement of insular territories. Furthermore, OTIE commitment towards the objectives underlined in the Manifesto has been highlighted with the support given to the initiative of the EU Committee of Regions – CoR -to include the strategy for Tourism in EU work programme 2018. This project has been put in effect through the Open Letter addressed to the European Commission, where OTIE and all the stakeholders organizations pointed out that Tourism is a driving force for regional cooperation across the EU. The International Institute Life Beyond Tourism® is an active place of research created by the Romualdo Del Bianco Foundation which intends to pursue and implement the intents contained in the Life Beyond Tourism® Manifesto, enabling its application in the territories. Intensive Course Training for Trainers are now available at the Life Beyond Tourism® website.